Did I say that 2017 was the fastest year? Well, I said wrong. 2018 was definitely the fastest year to end, ever, so far, tehee. Looking back on my previous post, people are saying that I had an amazing year, even I was thinking that I had an amazing year. But then I just realized, we usually would take photos on our happy moments but didn't take a single one on our bad days. Since I don't have photos on the bad days so I didn't talk about that on my 2018 recap post. A few bad days were the day I failed my PTD assessment or the day I screwed up my presentation because of my shaking voice and many more. So yeah, 2018 was the happiest year I had but also was the saddest one too. Anyway, not wanting to look back any longer and just visualizing the future, also since I don't care if it's already late, here are what I plan to do in 2019. And by this, I meant to eat clean and exercise on a regular basis. I usually didn't think much about food and exercising and it always went off balance so I want to fix that, or maybe just another way in saying that I wanna lose weight? Okay, I'll admit, this is definitely my new year resolution since birth. But now Imma put on a target for it, I want to be 45kg by the end of the year. Wish me luck! I started my sketch post series around early 2017 but obviously, I failed at keeping it up. The same goes for my writing on this blog (also on my planner) and my reading. I realized that I've been wasting my time so much doing nothing and kept being emotionally sad during my free time which sometimes leads to my anxiety and depression. I want to fix that. I should've been glad that I know what makes me feels content and happy; writing and drawing while reading is a way to kill time beneficially. So I plan to draw, read and write more consistently in 2019. As I've mentioned in my bucket list last year, I plan to travel at least once a year and this year I plan on visiting South Korea or Yogyakarta, or maybe both? Okay, definitely not going to be both because I really need to save money to finally do my masters study. Once I continue masters, I don't think I'll be able to go travelling, sobsob. 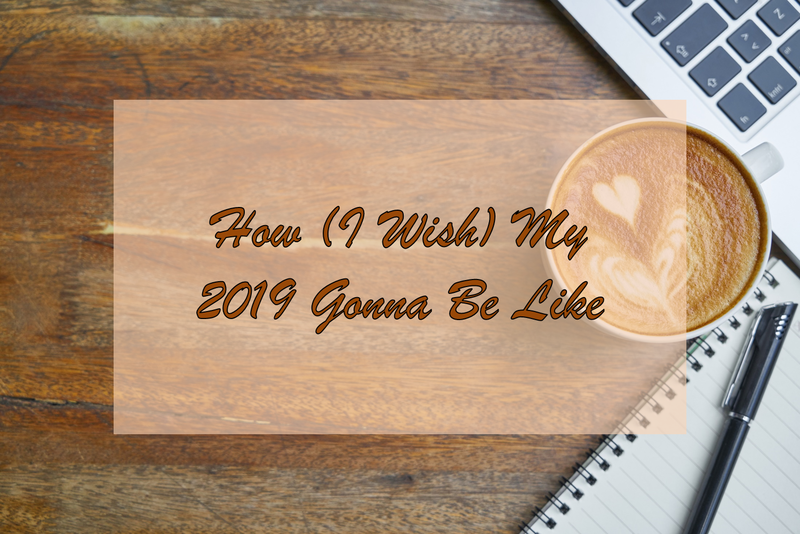 So I've shared my 2019 plans, feel free to share yours! I do have my 2019 resolutions but im not putting so much hope on it. I also wanted to eat clean and lose some weight but im eating more than ever lol. I also plan to go travel tapi kena saving. Alahai. But hopefully benda2 lain dapat achieve lah. Lesss do diz! These three basically my resolution for every year! But I guess I still not take it seriously enough so yeah, let's strive for it this time, we can do this! I'm so so lazy to do masters but in order for my career improvement, I need to do it so yeah, I plan to do it later this year or early next year, wish me luck! I'm still contemplating for these two places but of course I'm more into Seoul as I'm an avid Kpoppers, lol. Semoga dapat jadikan motivasi untuk capai apa yang kita nak tahun ni!